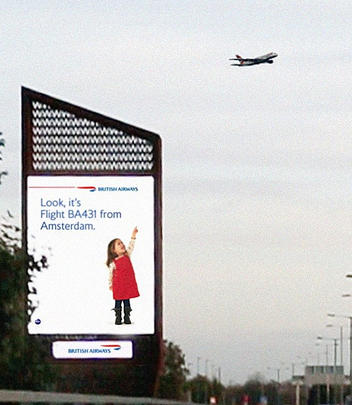 British Airways install interactive billboards – Love PR? Have you ever seen a plane and wondered where it was flying to? 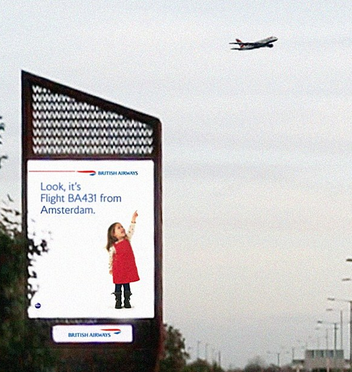 British Airways are aiming to bring back the magic to flying with interactive billboards. The digital screens installed by the airline, in Piccadilly Circus and Chiswick in London, show a child standing up and pointing to the aircraft as it travels above the sign, and then displays the flight number along with the plane’s starting point. Specially-designed surveillance technology track the planes, interrupting the digital display just as the plane passes over the site, revealing the image of a child pointing at the plane overhead accompanied by its flight number and destination.